The integrated operations (iOps) solution combines visualisation hardware and software with an advanced technical console to enable an operator to more quickly interact with multiple information sources, improving productivity and situation resolution. The iOps Workspace Solution was developed in conjunction with workspace providers Barco, Vertiv and Evosite. It combines many operator input sources into a single, virtual workspace, integrating information at the operator interface. Operators only need to log in once at a single workspace to gain access to all monitoring and control areas for which they are responsible. Project services marketing manager for the iOps Workspace Solution Todd Brase said: “Emerson’s new iOps Workspace Solution, with its customisable user interface, enables operators to securely control and monitor numerous sources residing on different networks. Applicable across multiple industries, the new solution especially suits oil and gas, refining, petrochemical, and life sciences operations where a centralised control room is used to manage multiple process areas and interact with a myriad of enterprise applications. 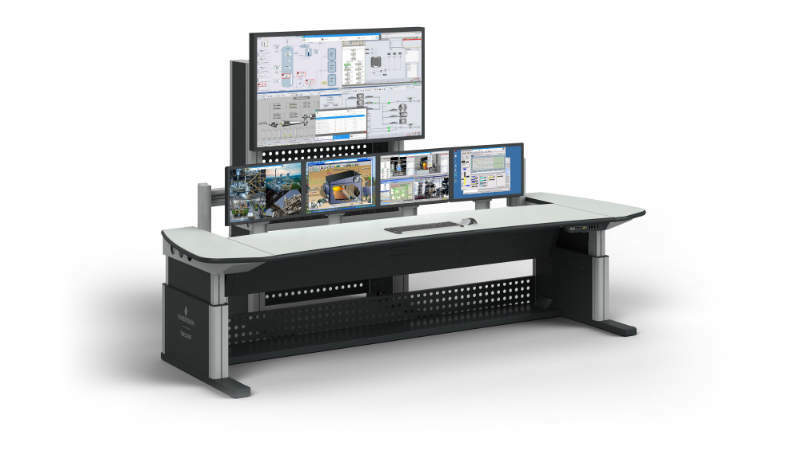 The iOps Workspace Solution can manage inputs from any number of third-party software applications, live video feeds, and Emerson’s array of automation software and hardware, including the DeltaV™ distributed control system. Barco’s operator workspace software OpSpace provides an integrated at the glass experience that helps control room operators work in a more intuitive way. Vice-president operator experience and chief operating officer at Barco Chris Sluys said: “We started development of OpSpace by first gathering feedback from operators in the field, describing their ideal way of working. Vertiv and Evosite offer advanced technical furniture designed to operate 24/7 in control rooms and operations centres. Combining adjustable sit-stand settings with spacious, high-pressure laminate work surfaces gives operators an ergonomic work area that reduces strain and allows them to work more effectively. Barco designs technology to enable bright outcomes around the world. Seeing beyond the image, Barco develops visualisation and sharing solutions for the enterprise, healthcare and entertainment markets that help people work together, share insights, and wow audiences. Knürr Control Room Infrastructure, a Vertiv business, and Evosite are global leaders in designing, manufacturing and delivering advanced solutions for mission critical control rooms, including control room design and ergonomic consoles that improve operator productivity.